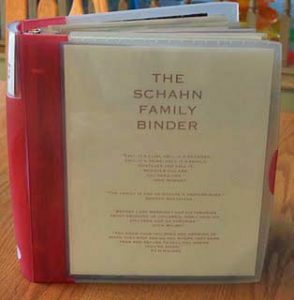 If I had a list of the ten most useful organizing tools I use with my family, a family binder would have to top the list. The Family Binder is the sort of thing that you don’t notice is there, but without it you would waste a lot of time. The binder actually came about because I hate piles of stuff, especially paper laying around and getting things all cluttered. I wound up tossing some papers that I wished I had kept, so I started the binder as a way to keep those informational flyers and such that you need to refer to sometime down the road but don’t want all over the refrigerator or on your counters. I use a binder that I purchased at an office supply store. On the front cover I put a title and then some quotes about family. This is my favorite: “Before I got married I had six theories about bringing up children; now I have six children and no theories.” – John Wilmot. On the inside cover is a pocket. I put often called phone numbers in that pocket (our cell phones, kids’ friends, emergency contacts, school info). There are 9 sections to my binder, each one has a tab divider that is also a folder. The first section is Household – this has things we need to refer to as a family or for the house. Things like graduation party invitations, reminder cards to call for a furnace service, etc. I also print up a form for all the kids’ schools that I can check off if they are coming late, leaving early, someone extra is coming for lunch, etc. I just check off which kid, which school and which reason, just sign and give the kids before they head to school – this saves me time and lets me get it done last minute if the bus is coming up the road as I remember I need to send a note! I do this each year and just print a bunch off to put in the binder to use as needed. The next 6 sections are for each person in our house, by name. For the kids, I keep their information for school (calendars, email addresses, coming events) and activities (contact lists, schedules) in these areas. Each item has it’s own page protector, so I can sort through easily to find what I need. When the event is coming in the next day or two, I post it on the fridge and then toss it when it is over. I put birthday invitations with the gifts (once I have them and they are wrapped), so we have the directions and phone number on our way to the party. My husband and I keep whatever we need handy in our sections and clean out our own periodically. There is a section for Church, which has our schedules, religious classes and related information. The final section is Other. It has take out menus (since we rarely use these, it is in the back) along with some owner’s manuals that are needed periodically (to reset alarm clocks, that kind of thing). Good times to go through and purge items are when a quarter ends at school, over Christmas break, when the school year ends and when the school year begins. I like to do this when we are in the car for a longer period or while we are watching a family move or show (I cannot just sit there!). We keep our binder in our kitchen on a bookshelf and that way everyone knows how to find what they are looking for when they need it. We have used it for several years, and it really works well for us.